Now that Fall is here, and it’s time to bring in the last of the garden, things are getting busy! 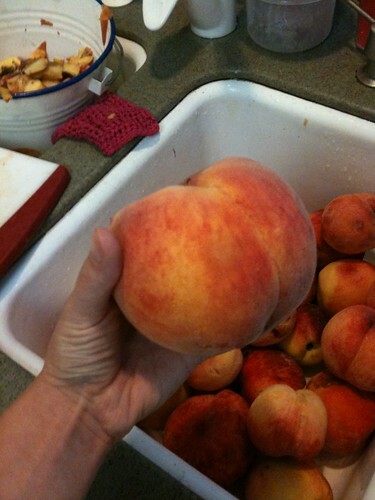 We had the 2 cases of peaches that were canned, and the one that was frozen. 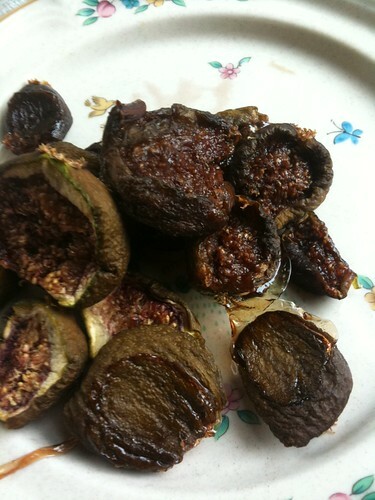 Oven-dried figs, from Mom’s tree. I didn’t get a picture, but I’ve dried a few sheets of roma tomato halves as well- they’re stashed away in the freezer for this winter. Drying is easy- cut the fruit in half the long ways, lay them skin-side-down on a cookie sheet (I use a silicone mat, too) and leave them in a warm oven with the door cracked. My tomatoes took about a day, but the figs were faster. I literally have a “keep warm” setting on my oven- about 170 degrees. 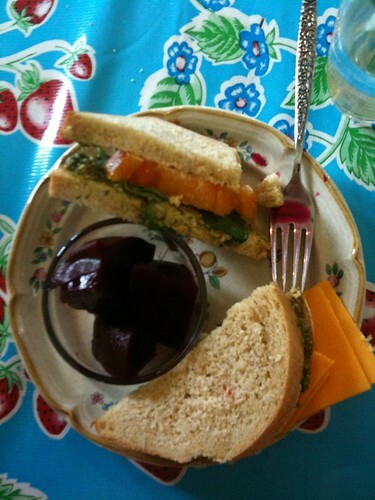 Orange tomato , basil, pesto sandwich- tomato from Mom’s greenhouse, basil from mine, and pesto…from Costco. Heh. These things just find their way home with me when I visit my parents! 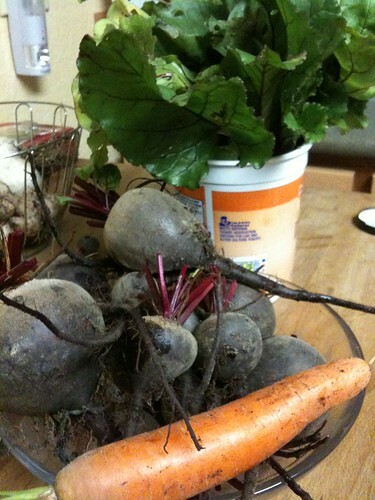 Oh, and pickled beets. Every sandwich needs a pickle. 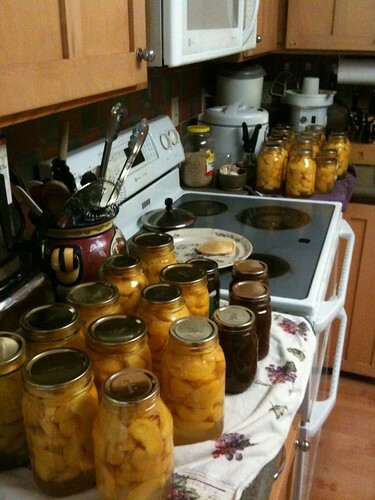 Here are the 25 quarts of canned peaches, plus a few pints of fig preserves. Again, the figs are from Mom’s tree. 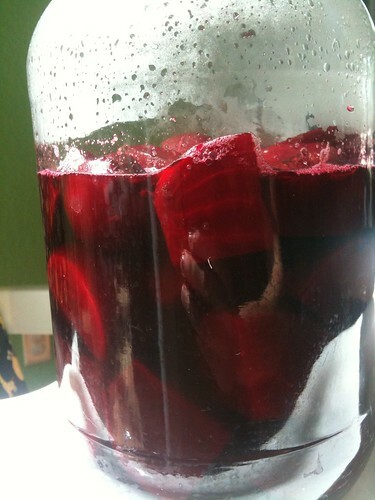 Pickled beets. So. Very Good. 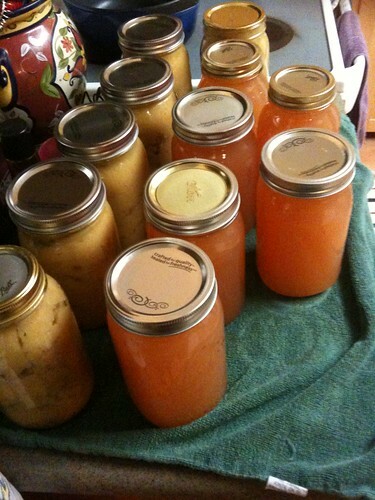 6 quarts of apple sauce and 6 quarts of apple juice, courtesy of two crates of apples I took off my friend’s hands. She was short on time and long on apples! I have another case of apples in the garage, plus a few more trees that need harvesting in Mom’s garden when they ripen. We ate our first red tomato tonight with dinner, it was AMAZING, but I just know we won’t get many more. There are a few that are pinking up, and I’ll let them ripen in newspaper. I’ve been collecting green tomato recipes- I’ll load some gallon bags up for the freezer, to use them in curries this winter. I’ll pickle a few quarts too, but that seems like such a leap of faith- the best recipe I could find on allrecipes.com says it takes 3 months for them to pickle in the refrigerator. What if I don’t like the brine? I had an AMAZING pickled green tomato from a friend a few months ago- she bought it at a store, so I can’t get the recipe. But it had the funk of a good green olive, plus a little heat. Oh my wow, it was good. If anyone has a favorite pickle brine, please share!